Fire shot from the roof of a church Wednesday evening in Warwick, Rhode Island. 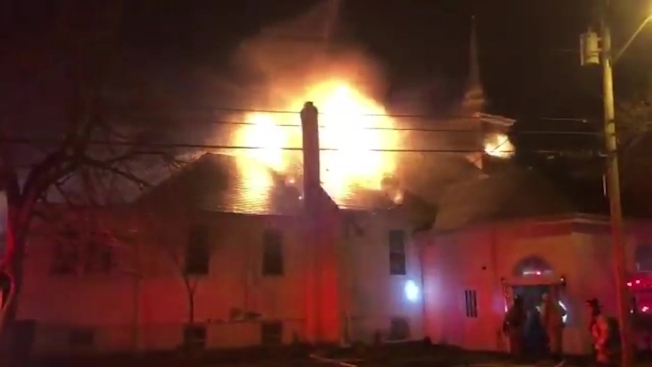 NBC affiliate WJAR reports that a 2-alarm fire broke out at Woodbury Union Church on Beach Avenue around 7:45 p.m. on the evening before Thanksgiving. Parishioners stood outside crying as crews battled the fire. "I was baptized in this church 73 years ago and I don't know what to say," Marilyn Baker told WJAR. "We'll rebuild." Authorities believe the fire started in the back of the building and spread quickly inside, making its way to the roof. WJAR reports that no one was inside at the time. Foul play is not suspected, according to the report.